This beautifully remodeled and updated vacation home in desirable Lake Mirage Racquet Club overlooks the lake, has great mountain views and is located close to the pool and spa. The spacious 1,900 sq. ft. floor plan offers a large living area, formal dining, spacious kitchen and three full bedrooms, three baths. This is a gorgeous vacation home and one of the best remodels in Lake Mirage. Attention to detail and comfort adds a 5-Star Spa feel to this wonderful home. The owners care about their guest's enjoyment ... and it shows throughout this much loved vacation home. The home has a beautiful mix of contemporary and mid-century modern furnishings throughout and many unique mid-century touches. The living room features a working fireplace with a large flat screen HD TV mounted above. Both the living room and master bedroom offer stunning views of the lower lake. Beautiful new tile and carpeted floors throughout add a light and sparkling clean look to this wonderful vacation home. The atrium off the dining area adds even more sun and light to the home. The spacious, well equipped kitchen has been completely updated with custom cabinets, stone counter tops, stainless appliances and a convenient chef’s island. The kitchen has a table with seating for four, perfect for casual meals and the formal dining room seats six. The updated interior laundry room is located between the kitchen and garage. Overlooking the back patio and lake, the master bedroom has been furnished with a king size bed, new bedding and has a large flat screen TV. The updated master bath has his and hers sinks, separate WC, and your “dream” shower; a spectacular oversized walk-in shower with multiple showerheads. A second, smaller master suite has been furnished with a queen size bed, new bedding, flat screen TV, DVD player and also has a private bath with single sink and bath/shower combination. The third bedroom has been furnished with two twin beds and has an adjoining bath with single sink and walk-in shower. Offering exceptional indoor/outdoor living, the back patio is the perfect spot for your morning coffee or sunset BBQ. Comfortably furnished with two chaise lounges, patio table and chairs for six and stainless BBQ grill, add in the beautiful mountain views and we know you will spend much of your visit outside. Additional amenities include WiFi, free unlimited US and Canada calling, cable TV and DVD. Completely renovated, updated and furnished in the summer of 2014. 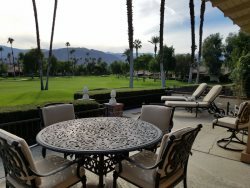 Guests of Lake Mirage Racquet Club may enjoy use of the clubhouse, lending library, 3 hole pitch and putt golf course, 11 swimming pools and spas, 3 racquetball courts, 2 pickleball courts, fitness center, jogging and bicycling path, 11 championship tennis courts located on a 25 acre lake. Court fees may be required. Located in the “Heart of the Desert” off Country Club Drive you are within a short drive to the desert's most popular dining, shopping and entertainment venues. Close walking distance to grocery store and Bristol Farms Market. Lake Mirage Country Club is located across from the Eisenhower Medical Center. This country club requires one month minimum rentals. Wonderful villa, beautifully decorated overlooking the lake. A very enjoyable and relaxing stay. Would rent again and recommend it to others. Lovely, well maintained property comfortable and especially clean. Spacious, bright and airy. Thoughtfully furnished including interesting accessories. Pleasant view of the lake through huge sliding glass doors from both the living room and the master bedroom. Nice new high def flat screen TV in the living room. I found the bed in the master to be especially comfortable. New bed linen and fluffy towels in the bath were appreciated. Fully functional and well equipped kitchen. Nice touches throughout, for instance: bedrooms are equipped with large pool towels and tote bags. There are two cruiser bicycles in the garage. We didnt use the racquet courts or fitness center but made good use of the pool and hot tub, both were clean, well maintained, and located very close to the condo. The attendant at the front gate was friendly and helpful. The grounds are nicely kept. The property is well located with businesses of all types at a convenient distance. We plan to return. Dont hesitate to stay here.